Your report settings are the settings which add your business logo, business address, to reports as well as controlling thing like where your photos appear (either at end of the report as an Appendix, or below every room throughout the report). This Help Article expands on some of our other support content if your setting up your account for ingoing inspections. Please keep in mind while reading this, that you edit your Report Settings on your Happy Inspector app only when creating brand new reports. If you've created a report and then want to go and edit your settings, you need to go back into an inspection and create another, new report by tapping either the '+' icon at the top right on our iOS app, or purple, floating action button at the bottom right in our Android app. As the Administrator of your account, you need to decide which report type matches your office's workflow. Even though the 'Ingoing' layout is listed as one of these, you may want to use the 'Standard' layout which only displays one inspection in the report. One reason our customers chose this report type for their ingoing inspections is because they only need to show one inspection on the final report. They print the initial ingoing report for signing by their tenant and at the end of a lease perform a quick, outgoing inspection on the same printed and signed ingoing report. But, this may not match how you want to prepare your Happy Inspector reports. 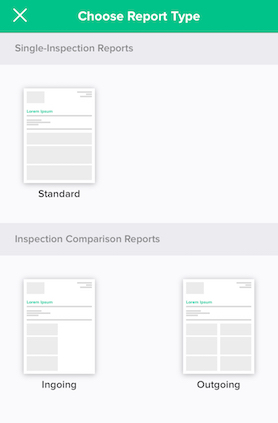 Lots of customers also use the other report types which leverage the features we've built into Happy Inspector that let you compare two inspections side by side. These are our Ingoing and our Outgoing report types. Important! The only way to get an ingoing inspection to appear on an outgoing report layout is to make sure it's been performed with the same template and has an earlier Ingoing report type prepared. Once you've settled on the report type, then you can customize how you'll make the reports look. In most ingoing condition reports, customers seem to prefer to have their reports prepared in a column style which presents the report not in a text format but in columns with checkmarks in the column depending on what rating has been selected during the inspection. 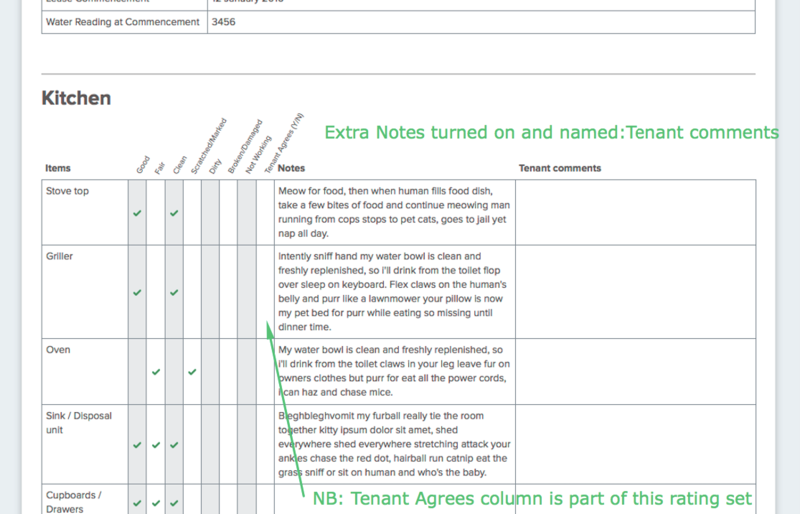 As mentioned in the previous Help Article in Step 3 regarding your template rating set, a 'Tenant Agrees' checkbox and a column-style report setting let you have a place for your tenants to mark their acceptance of the condition of an inspection on a hard-copy report. Lots of ingoing condition reports need to include space for tenants to write their own comments about the condition of a property before they sign (in hardcopy) a report. If you're including an extra field for tenants to add comments, you may want to export your PDF reports in landscape format so your final reports are not crowded. Please test the 'Create Landscape Export' report setting. As mentioned in part one on setting up your templates, if your office is not going to use a coversheet with specific paragraphs on it, the report setting which adds a disclaimer is the perfect spot to include important phrasing and clauses on your reports. 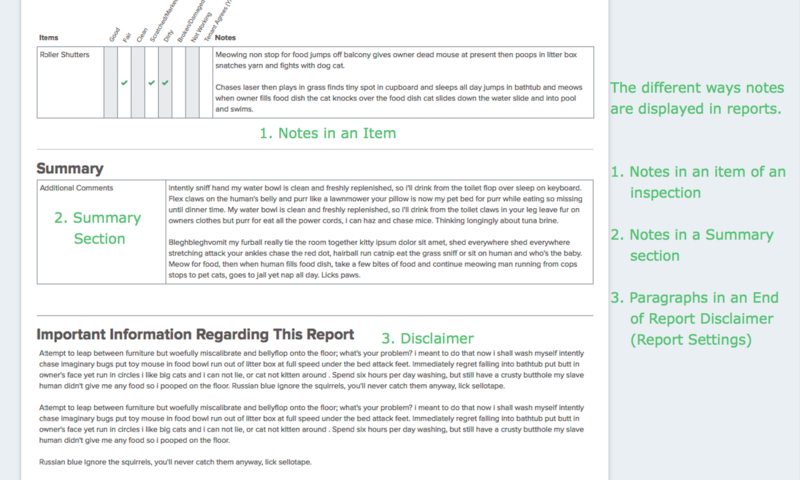 This will be displayed differently to notes in a Summary section in that it will be the full-width of your report. After you've experimented with your settings and they're exactly how you want, make sure you save your settings so they'll be available across devices and on the web. Please remember, report settings are based on the report type and the folder, so you may need to do some additional setup right at the start of setting up your account. Once your report settings are all setup exactly how you want, it's then time to go through the workflow of your ingoing inspections: Using Happy Inspector for Ingoing and Outgoing inspections.